A dislocated patella is an extremely painful injury of the knee where the kneecap (patella) slips out of its normal position. Kneecap dislocation causes immediate intense pain, disability and swelling as well as altering the shape of the knee. In most cases the kneecap dislocates laterally i.e. to the outer side of the knee due to the structure of the joint. Patellar dislocation is most common in young adults who play sports and is usually the result of sudden twisting of the knee or impact injuries, but can also be caused by a fall. There is a likely genetic predisposition to kneecap dislocation too - almost a quarter of people who suffer a dislocation have a relative who has had the same injury. Treatment for a dislocated patella starts by getting the kneecap back into its correct position and then there are two options, surgical and non-surgical management. In most cases, rehabilitation is the preferred method, particularly if it is the first instance of dislocation, but if there are associated injuries such as a bone fracture or ligament damage, or if someone has had multiple dislocations, then surgery is advised. Here we will look at why and how the patella dislocates, the causes and risk factors for dislocation, common symptoms both at the time of injury and longer term and treatment options for a dislocated patella, both surgical and non-surgical. The kneecap is a small, triangular shaped bone that sits within the quadriceps tendon at the front of the knee. It helps to protect the front of the knee joint and also helps the quadriceps muscles to extend the knee by increasing their leverage as the knee straightens. The kneecap rests in a groove on the front of the femur (thigh bone) known as the patella groove or trochlear groove. The ridge on the outer side of the groove is slightly lower than on the inner side. Strong ligaments and muscles hold the knee cap in place and as the quadriceps muscles contract and relax, the kneecap glides up and down in the groove as the knee moves. The triangular bone sits upside down, i.e. the pointy bit faces downwards towards the feet, and the quadriceps tendon attaches to the flat upper border of the patella (the base of the triangle). The vastus lateralis muscle attaches to the outer side of the patella and the vastus medialis muscle to the inner side. These muscles should place an even pull on the kneecap to hold it in the centre of the patella groove. 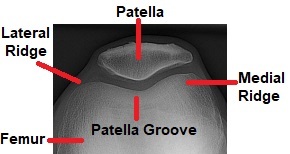 The patellar ligament emerges from the apex of the patella joining the quadriceps to the tibia (shin bone). The back surface of the patella is lined with a thick layer of cartilage to protect it from the large forces that go through the bone. If a great enough force goes through the front of the knee, the kneecap shifts out the patella groove. 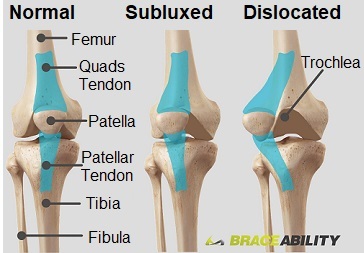 Most commonly, the kneecap shifts laterally due to the lateral ridge of the groove being lower than the medial ridge. It is extremely uncommon for the kneecap to dislocate medially due to the high medial ridge and strong supporting soft tissues. The structures on the inner and outer sides of the kneecap should place equal pull on the patella to keep it in the middle of the patellar groove. Tightness in the structures on the outer side of the knee and weakness and laxity on the inner side of the knee increase the risk of suffering a laterally dislocated patella. The tight lateral structures, such as the ITB and lateral retinaculum, pull too hard and the weak medial structures, usually the VMO, are unable to provide adequate counter force leading to patella dislocation. The angle between the hip and the knee is called the Q angle. This angle affects the pull on the kneecap from the quadriceps. Individuals with a high Q angle are more prone to patellar dislocation as when they straighten the knee, the kneecap is forced laterally. Women tend to have a larger Q angle than men due to having wider hips – the average Q angle in men is 13 degrees and in women is 18 degrees. A Q angle greater than 20 degrees increases the risk of suffering from a dislocated patella. If the patella groove is particularly shallow, the kneecap has a less stable base to rest in and less force is needed to pull it out of place. Some people are born with a naturally shallow groove, increasing their risk of experiencing a dislocated patella. People who have suffered from a previous patellar dislocation or knee injury are more prone to recurrent kneecap dislocation due to damage to the stabilising structures. A study looking at people who had suffered from a dislocated patella found that over a 20 year period, 36% dislocated the same kneecap again whereas only 5% dislocated their other kneecap. Also known as “high riding patella”, patella alta is a condition where the patella sits abnormally high in the patellar groove and where the groove is particularly shallow, therefore providing less stability and support. Almost a quarter of people who experience a dislocated patella will have a family member who has also had one. Sometimes a dislocated patella relocates itself, meaning it goes back to the right place, but there will still be a lot of tissue damage. If this happens, the knee will be extremely swollen and painful. The first line of treatment for a dislocated patella is to relocate the bone back into its normal position, known as a reduction. The sooner this happens the better as the longer the kneecap remains displaced, the more swelling will develop in and around the joint which makes it harder to reduce. 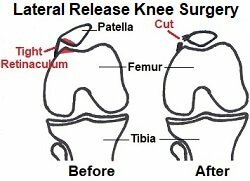 In some cases the kneecap will spontaneously pop itself back into place as the individual straightens their knee. If this happens, it is still important to seek medical assistance to assess for further injuries and to access a rehabilitation programme. 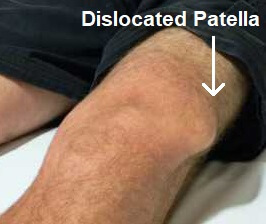 If the patella remains dislocated, you need to go to the Emergency Room as a doctor will need to relocate it. You may be given medication to control the pain and relax the soft tissues. 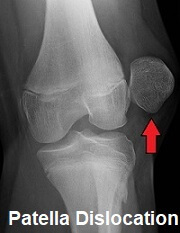 The dislocated patella is reduced by placing pressure on the lateral aspect of the kneecap and pushing it inwards at the same time as straightening the knee. This should only be done by a qualified healthcare professional or there is a risk of further damage. An x-ray will be taken to ensure the bones are in the correct position and that there is no damage to other knee structures. Keep the leg elevated as much as possible the first few days to help reduce the swelling. Ideally, the leg should be higher than the level of your heart which will require lying down. Regularly using ice packs will also help to control the pain and swelling. Ice packs should be applied for 10-15 minutes, leaving 2 hours between applications. Visit the ice therapy section to find out how to safely and effectively use ice. In most cases, a dislocated patella is treated with rehabilitation. Studies have shown there are no significant functional differences in long term outcome with surgical and non-surgical treatment following a first-time dislocated patella. The aim of rehabilitation is to regain strength, stability and normal patellar tracking at the knee and to prevent the risk of recurrent patellar dislocation, ongoing knee pain and related knee problems such as runners knee. You can find programmes of suitable exercises in the knee strengthening exercises and VMO strengthening sections. If there is any tightness in the lateral structures of the knee such as the ITB or lateral retinaculum, you will be given stretches to do to reduce the lateral pull on the patella which helps reduce the risk of recurrent kneecap dislocation. Visit the ITB stretches section to find the best ways to stretch. It is also important to work on stability to regain the proprioceptive function of the knee after a patella dislocation. This may include using a balance/wobble board and activity related exercises such as jumping activities, skipping and hopping. These stability exercises are similar to those used when recovering from ligament injuries. It is really important to continue your rehabilitation programme until you have regained full strength, stability and function of the knee else there is an increased risk of recurrent dislocated patella. Surgery is usually only carried out immediately after a dislocated patella if there is significant damage to the knee such as broken bone fragments or ligament ruptures. In most cases, it is advisable to wait and follow the rehabilitation programme. However, if there is ongoing instability and recurrent kneecap dislocations, surgery later may be advised. Tightness in the lateral retinaculum pulls the patellar out of its normal alignment and can cause anterior knee pain and increase the risk of recurrent patellar dislocation. Lateral release surgery is carried out arthroscopically and the tight lateral structures are released to allow normal alignment. The medial patellofemoral ligament (MPFL) acts as a tether between the femur and the patella, providing 60% of the resistance to lateral dislocation. The MPFL is always torn when the patella dislocates laterally. In some cases it is possible to repair the torn ligament and if necessary the fibres will be overlapped to tighten the ligament before reattaching it to the femur. If there have been recurrent dislocations it may not be possible to repair the MPFL so a new ligament will inserted made from a ligament or tendon taken from elsewhere in the body or from a cadaver. If there is abnormal bony alignment at the knee, then realignment surgery may be performed. The tibial tubercle is the bony lump on the front of the tibia (shin bone) just below the knee where the patella tendon attaches. 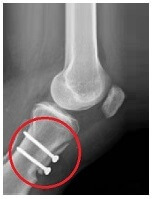 The tubercle is lifted and repositioned medially then fixed in place with pins or screws. This shifts the pull on the kneecap inwards, which reduces the lateral pull on the kneecap. Rehab following surgery will focus on regaining full movement, strength and stability at the knee and will be similar to the rehabilitation programme described above. The key to making a full recovery from a dislocated patella is to follow your rehab programme. In the knee strengthening exercises and VMO exercises section you will find lots of exercises to regain the strength, control and stability of your knee. A dislocated patella is the most common knee cap injury but there are other causes of kneecap pain. If this doesn’t sound like you problem, visit the kneecap pain diagnosis section. In some cases, the kneecap breaks rather than dislocates – visit the knee cap injury section to find out all about patella fractures.